Today François Hollande was a guest of Barack Obama. The French President is visiting Washington D.C. in an effort to build a stronger coalition in the fight against Daesh (aka Islamic State, ISIL, ISIS). Yesterday he met with David Cameron, Wednesday he will meet with Angela Merkel - and on Thursday the Mr. Hollande will meet with Vladimir Putin. 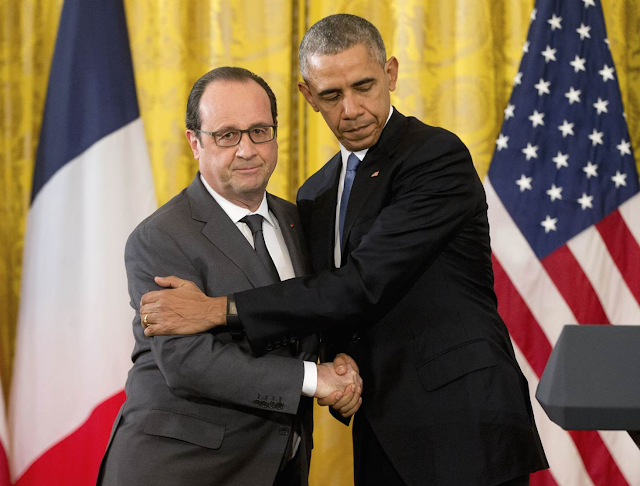 In the above image, Hollande and Obama are shown in a Handshake-Hug Hybrid. Note that although the two men are touching (and thus within each other's personal space - and more specifically, their intimate space) - and of course their heads are also quite close together - in contrast, their eyes are directed away from the other man. The vast majority of the time - when we enter another person's personal space, our gaze naturally and rapidly averts. One exception to this strong tendency is with close family members or with others for whom we have considerable affection. Can you name any other nonverbal scenarios where this rule doesn't apply?